The Bergmans Mechatronics LTS-100 Laser Temperature Sensor uses Tunable Diode Laser Absorption Spectroscopy (TDLAS) to achieve accurate, high data rate and non-intrusive gas temperature and H2O concentration measurement. These properties make the device ideally suited for sensing in mechanically and chemically challenging environments and for use in closed-loop combustion control applications. Through a marketing agreement with MetroLaser, Inc, the developer of the core TDLAS technology of the instrument, Bergmans Mechatronics LLC is offering the LTS-100 sensor to the industrial marketplace in an effort to reduce the costs and improve the performance of traditionally difficult temperature and H2O measurements. The basis for operation of the LTS-100 is the fact that absorption of electromagnetic radiation by water molecules in a gas is dependent on 1) gas temperature and 2) radiation wavelength. The instrument transmits electromagnetic energy, in the form of laser light at specific wavelengths through the high temperature combustion gasses and then quantifies the resulting absorption of the laser energy at different wavelengths to determine the gas temperature and water concentration. The implementation of this concept for measurement of conditions within a furnace or boiler is shown at right. A tunable diode laser within the LTS-100 Processing Unit generates a beam of laser light. The beam wavelength is continually modulated, or "tuned", over a narrow portion of infrared region of the electromagnetic spectrum. 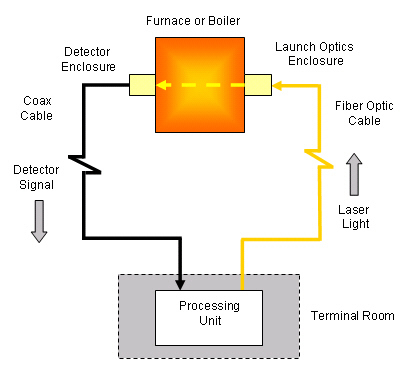 The beam is transmitted down the length of an optical fiber and enters the Launch Optics Enclosure mounted on one side of a furnace or boiler. The beam then passes through the combustion gasses and strikes a photodiode detector within the Detector Enclosure mounted one the opposite side of the furnace or boiler. The output of the photodiode detector is transmitted to a data acquisition board contained in a PC within the Processing Unit. Software on the PC calculates gas temperature based on calibration data relating beam attenuation and laser wavelength to gas temperature and water concentration. Further details on the theory and performance of the instrument are provided in the technical papers below. BML and MetroLaser have performed demonstration testing of the LTS-100 in a variety of environments. This work is summarized in the following technical papers, downloadable in PDF format. "Progress in the Development of a TDLAS Sensor for Industrial Applications"
Testing of the LTS-100 at the Ameren Sioux Station coal-fired power plant in September 2007 is documented in this paper. Measurements were made along a 48 foot beam pathlength at the Furnace Exit Plane of Unit 1. The Laser Alignment System component of the LTS-100 enabled nearly continuous measurements to be made at this location for a period of 37 hours. The paper shows that while the boiler temperatures measured by the LTS-100 are higher than the expected values, the instrument is able to resolve small changes in temperature which correspond well with expected temperature changes. An updated comparison of measured and expected temperature changes is shown in the separate slide at left. This slide is an excerpt from the conference presentation which was prepared after the paper was submitted. Initial testing of the sensor on an oxy-fuel combustor, also performed in September 2007, is included in the presentation. The results of these preliminary tests demonstrated that the instrument is sensitive to changes in O/F ratio in this high temperature environment. American-Japanese Flame Research Committees International Symposium, Waikaloa, HI, October 22-24, 2007. A comparison of LTS-100 measurements with nearly simultaneous suction pyrometer measurements over a beam path length of 13.2 feet is presented in this paper. The paper concludes that the LTS-100 measurements match the path-averaged temperature of the suction pyrometer to within the estimated accuracy of the pyrometer. The testing work was performed in August 2005 at John Zink Company LLC, Tulsa, OK. Description of LTS-100 testing in a regenerative oil-fired glass plant furnace in January 2005. Temperature and H2O measurements clearly show the changes in gas conditions in response to the cyclical furnace flow reversal. The 60 foot beam pathlength through the furnace produced substantial absorption at the absorption wavelengths and results in a high signal to ratio. Irvine, CA, November 1-3, 2005. Maui, HI, October 10-13, 2004.